Svyatoslav Roerich often wrote his father – finding special pleasure in the portrait genre, he did not find better models than his relatives, because he knew them best of all, it was their features that he could write even with his eyes closed. Searching for new things in them, opening the caches of souls, he worked through his own technique, learning over and over again to re-understand people who were with him constantly. 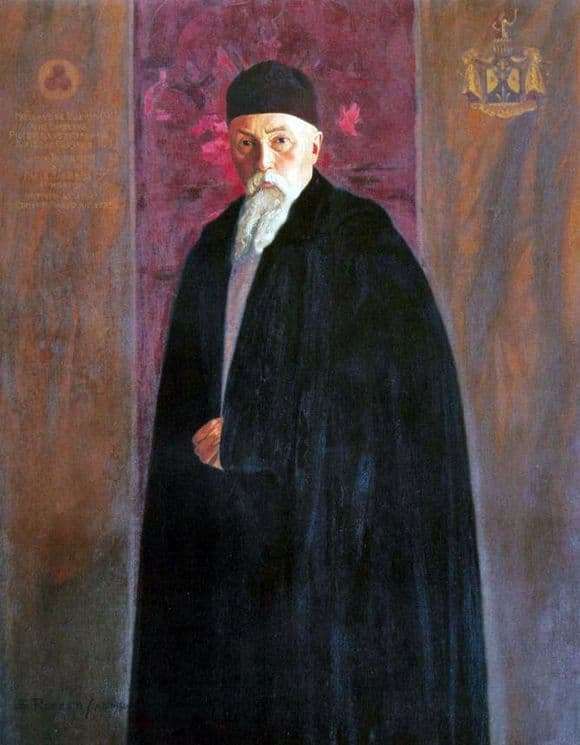 The “Roerich’s Portrait” stands out from the series of portraits by the fact that it has surprisingly few details that can distract the viewer from the main figure. Roerich so attached to the landscapes inserted into the portraits, insignificant details of the situation, is limited to the vision of the scarlet bloody sky behind the father’s back and the stylized image of weights in the upper right corner. There is nothing more that could distract from the central figure. Even the garment is drawn quickly, indistinctly, in fact represents a black spot, in which there are no sewing delights. But on this empty, boring background, Roerich’s face becomes clearer and brighter, illuminated by some kind of inner light. He is old. A long white beard, light as swan’s down, meticulously laid on the chest. There is a black cap on the head, no hands are visible – only one looks out almost and hardly attracts attention. His eyes attract, his eyes are intelligent, serious and strict, directed slightly to the side, not directly at the viewer. Catching it on the tip of the brush, Roerich handed it delicately precisely, with care, which many others might envy. In this view, there are thoughts about what life is like and the peace of a person who has lived a long good life, and the satisfaction with this life, with the fact that the air fills the lungs, with the blood running through the veins. It seems that when Death herself comes to his last refuge, the old man will smile at her and give her a hand. There is too much dignity in this man to do something else.